If you live in Austin and are involved in the music scene, chances are you either know Nick personally, or know who he is. A skilled engineer, touring musician and, most recently, tour manager, Nick has made a name for himself in the business. 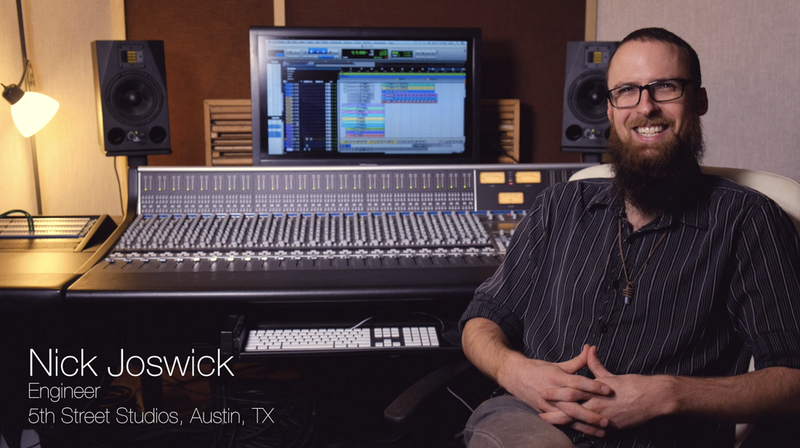 As studio manager at 5th Street Studios, Nick helps artists and bands of every genre produce, record, and master their work. As a longtime Recording Connection mentor, he works to instill hands-on skills and can-do thinking in the students who apprentice with him. We recently caught up with Nick and asked him what he’s been up to over the past few months. Turns out, he’s been doing a lot! In case you’re not familiar with Black Pistol Fire, they’re a blues rock garage duo that cites Led Zeppelin, Nirvana, and Muddy Waters among their list of influences. As tour manager for the band, Nick has helped them work the circuit, playing at venues large and small across the U.S., including a recent appearance at the Stagecoach Festival, a massive festival that takes place in Coachella Valley and which is put on by Goldenvoice, the same entertainment group that hosts Coachella. Now that he’s back in Austin, Nick’s also working with the seriously cutting-edge live hip hop group–Magna Carda– who’s primed to hit big. Asking him about the project, the excitement one hears in his voice is palpable. Nick understands the value of both hard work and proximity and says most gigs come to him through “who knows me and who is aware of my work.” Past projects and affiliations with White Denim, Morcheeba, and Israel Nash have yielded collaborations that are part of the strange, eclectic mix that is Austin-based music. As a mentor, Nick knows how important it is to be in the right place, at the right time, on the right project. He wants the students who apprentice with him to have a proactive, can-do attitude and to be people with passion, people worth investing in. One notable former apprentice of Nick’s, Chris Locke, started the program with little to no knowledge about what audio engineering was or what went into the work. Now, Chris has gone from delivering pizzas for Pizza Hut to being voted Austin’s Hip Hop Engineer of the Year (2016).